Manipur is situated in the North Eastern part of India and this state is named as the Land of Jewels coz of its rich tradition with many cultural aspects like dance, theater,sculpture, martial arts and the cuisine. The most distinct characteristic of this Manipuri cuisine is hot and rich in nature. This cuisine have many delicious dishes which are simple to cook and healthy to eat. The staple food of Manipur is rice,fish and leafy vegetables. Most of Manipuris have a kitchen garden where they grow vegetable and a pond where they grown up their fishes.Various aromatic herbs ,roots and certain vegetables are found only in this region are used to prepare their dishes that makes this cuisine so unique from other cuisines of India. Manipuris dishes are mostly hot and they use their locally grown chillies. Iromba is a popular Manipuri dish, this fish chutney consists of fermented fish called Ngari and chillies. Fish have their prominent place in Manipuri cuisine.Ngari is a favourite among the locals, they can give up the meal a day but they cant live without Ngari a day. Food is served traditionally on banana leaves and eaten by sitting on the floor. Eromba one among the popular Manipuri dish is prepared with potatoes,vegetable and with excess of chillies with dry fish while Singju is a healthy salad prepared with a variety of vegetable and Ngari. Kangshboi or chamthong is a dish prepared with seasonal vegetable and ngari definitely.Morok Metpa is a hot dish prepared with a mixture of dry chillies and green chillies,onions and coriander leaves. While the traditional dishes are hot, this cuisine have a special place for desserts too. Their desserts includes Chahou kheer(rice kheer), Madhur Jaan (gramflour fritters in sweet milk), Kheer Angouba, Khamen Ashinba Athoomba (sweet tomatoes), Sangom kheer (rice pudding), Chakhao Matum (black rice fritters) and Heinou Thongba ( a sweet mango dish) served usually after a heavy meal. I picked Chahou Kheer from this cuisine which goes for simple ingredients like rice,milk, few dry fruits and sugar. Chahou Kheer is nothing the rice kheer which i simply loved as this recipe goes for quick preparation, i used pressure cooker and trust me the cooking time is just less half an hour. 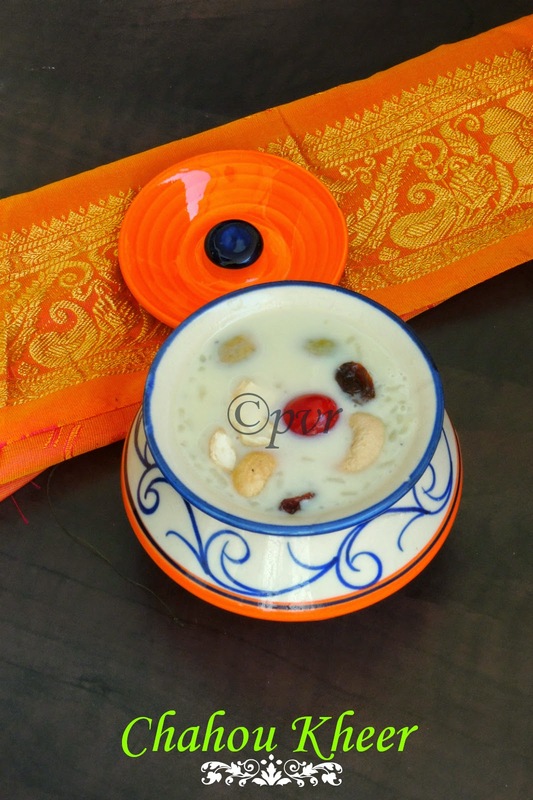 An easy breezy kheer you can enjoy both warm or chilled. Boil the milk in pressure cooker, add the bay leaves, cardamom,cook for few minutes. Add the soaked rice, sugar and give a stir. Once the pressure gets released, cook the kheer in medium flame. Add the raisins, grated coconut, cashewnuts,cook for few seconds. Serve warm topped with few dry fruits and cherries. Looks delicious Priya! Bay leaf in a kheer is very unusual. Did you taste the bay leaf? The kheer bowl looks very interesting..love the garnishes and presentation. wonderful post as always. now you made me crave payasam. Yummy kheer. these eastern states have a tendency to add bay leaves to kheer dishes. That's a lovely kheer, you guys have done a great job in translating their dishes! bay leafs in a kheer??? that sounds interesting... looks like a yummy bowl..
yumm yummm yummmy !!! Priya !!! Yummy kheer..cute props.interesting to know about recipes of other states. Such a delicious kheer! Bay leave seems to be a very common ingredient used in almost every dish. Sounds and looks so tempting. Encore une belle découverte qui met l'eau à la bouche. The kheer looks yummy! Love the taste of bay leaves in sweets. Lovely to see your post on Manipur cuisine. Great to know how each state treats the kheer and add their flavors. Loved the click. you have presented it so well Priya!! loving this delicious kheer!! Good one. I have observed that the Manipuris seem to be using Bay leaves in desserts, right? That is such a flavorful and delicious kheer. Such a creamy and yummy looking kheer..sounds very inviting.